The planets have big plans for January and there is great momentum available to achieve our goals in 2019. While the darkness of rage and despair may have dampened our resilience in 2018, this new cycle reignites our focus and hope: to face our challenges will be a great adventure. What stirs inside you now? What are you hoping to learn and what are you able to teach others? Do you dare to take healthy risks in a world of unknowns? What holds you back from making an impact? Our Willpower playfully erupts, we are ready to take action. Astrology is a powerful tool for mindful magic. 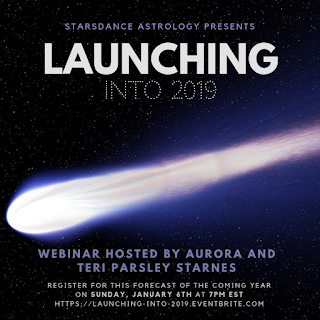 This webinar combines astrological forecasting with magical/spiritual intention to help launch our hopes and dreams for 2019. As activists and lovers of the world, we come together to envision collective and personal magic. Aurora and Teri will share the major astrological influences of 2019, with a look towards the important transits of 2020. Participants will be invited to ask questions and share insights for the coming year. All levels of astrological and magical knowledge are welcome. Beginners are encouraged! Teri and Aurora plan to offer continuing workshops throughout 2019 to support the intention discussed in this webinar. Get a start on this magic by attending. Launching into 2019 webinar will be recorded and available for purchase if you are not able to participate in the live Zoom meeting. Register on Eventbrite The sliding fee is $15 to $30. Reduced or waived fee for POCI and Queer folk.